Powering up more than 33% of all the websites on the internet with consistent growth, WordPress can easily boast on its bright and sustainable future. What's even impressive is that, if you only narrow the websites, built on CMS solutions then the WordPress market share gets even higher with a whopping 66%. WordPress supplements all the typical website content management system by facilitating e-commerce solution, multivendor market place solution, ERP solution, website analytics solution, SEO solutions and bringing so many more into the mix in the form of plugins, themes, and core features. The faster yet steadier evolution of the WordPress ecosystem is now attracting web developers or programmers for an amazing career. But you need to have an amazing set of skills before going on board. Here, in this article, we are going to show you those must have skills to be a full-stack WordPress developer. 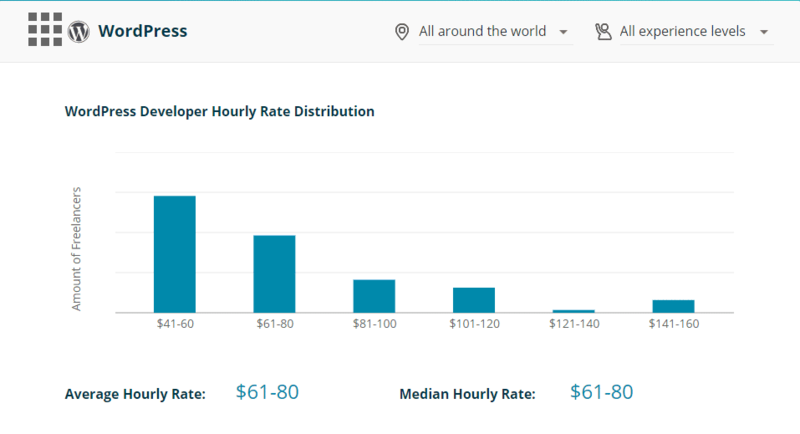 Do you think that WordPress developers are underpaid? No, not at all. 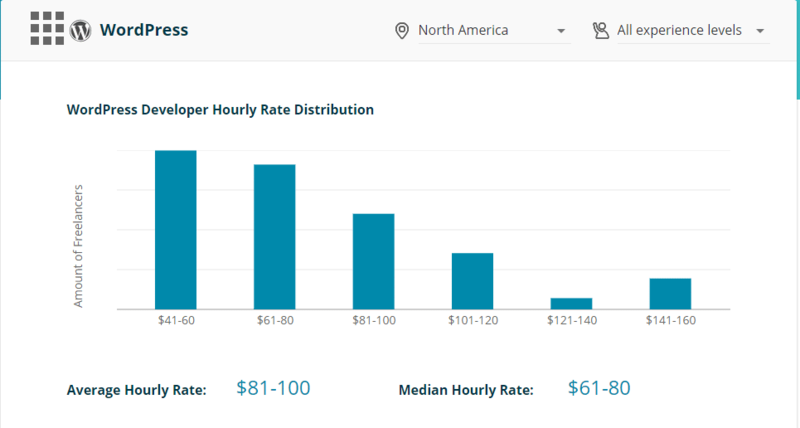 Give a read to these data to know the highly paid hourly rates to WordPress developers at CodementorX. More and more websites are adopting it as their CMS. This increased WordPress websites will require more WordPress developers. Now, desktop applications are also becoming online based. Which means more people will try to solve their problem using online tools which are serging in popularity nowadays. And WordPress is a great tool to convert a desktop application into an online application. WordPress is open source. So, you do not have to buy it to see its code structure. In case, you are a singer or dancer or a painter or a photographer, you must know the basics. Otherwise, you can not take your work at the next level which is called the ‘Art‘. The same thing goes in WordPress too! In WordPress atmosphere, you can develop either themes or plugins. Whether you are a theme or plugin developer you should have the following series of skills. 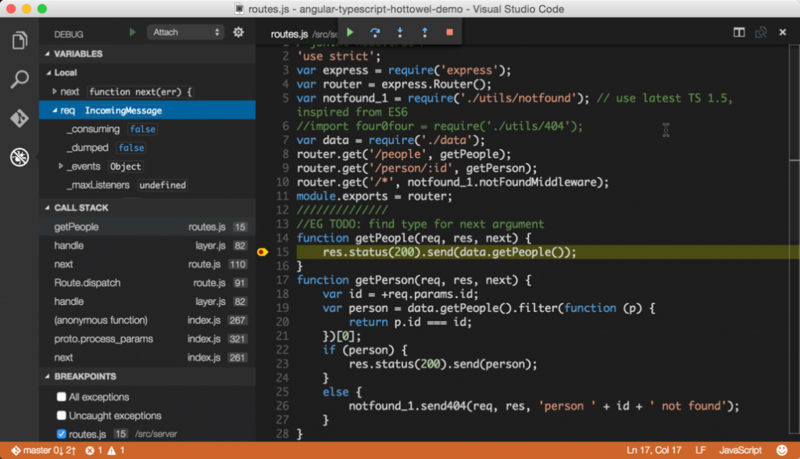 If you are on the way to learn codes, you have to choose a text editor that suits your needs. But for the beginner level code-learners, it is recommended to use Notepad ++ which is very simple to use. In order to speed up your coding skill, you can use an extension called zen-coding for the Notepad++ which will help you to write repetitive codes with a single click! After becoming an advanced code writer, then you can use more advanced tools like VS Code editor, Sublime, Atom, Brackets.io and so on. Choose an editor that fits your taste. In case you are new to WordPress development, you must know how to play around with the elements of a webpage. HTML is not a programming language but it is a markup language that displays the contents on a webpage. If you want to be an expert in HTML, you will need around 15-25 days and you will have to spend 7 hours each day to become an expert in this language. You can learn HTML either from the Khan Academy or from the W3School or from YouTube or from anywhere from the internet. Knowing HTML is compulsory for the WordPress frontend developers. Next up, comes the CSS which is inevitable stuff to become a WordPress Developer. The CSS properties are aimed to control the way an element looks on a webpage. Knowing CSS is mandatory for the WordPress frontend developers and it will take up to 25 days to learn it. CSS can also be learned from the same resources that I mentioned in the HTML section. If you are designing a WordPress theme or any webpage, you may need to convert PSD files to HTML. 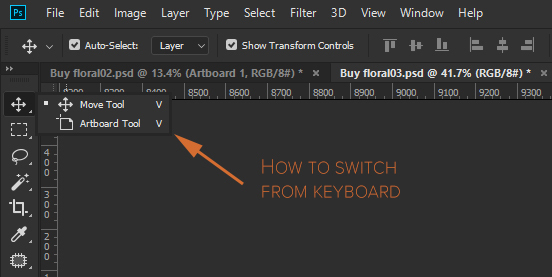 And to do so, you will have to know the use of Move tool in photoshop. You will need to know how to enable the auto select and layer option, select a layer and trim a photo. 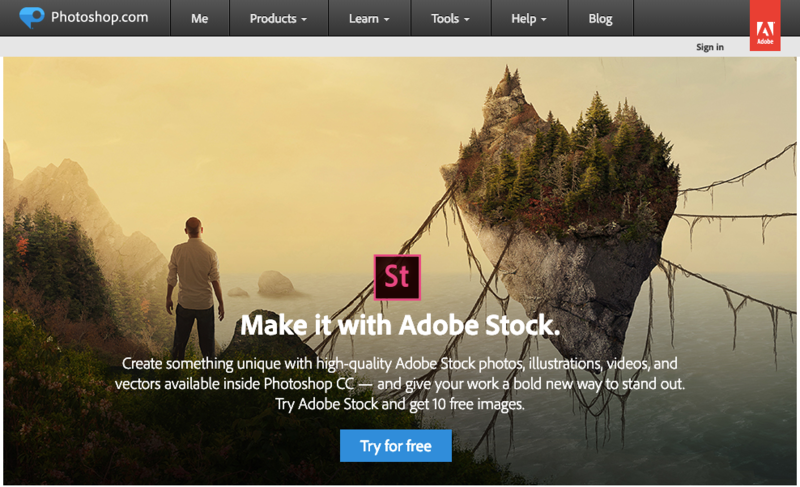 To learn how to convert PSD to HTML you can see YouTube tutorials. Typically it takes up to 2 or 3 months for a person who doesn't know a programming language but wants to learn it. You may also have to give 3 or 4 months to get accustomed to using libraries and frameworks. Who likes to code everything from scratch? If you code from scratch every time, you won't be able to complete your project in time. To meet the deadline you should be learning Bootstrap, a framework which includes the common HTML components like Navigation Bar, Carousel, Breadcrumbs, Forms, Progress Bar, Modals, Accordions and so many more. This is a very important framework for the WordPress Frontend developers. An alternative to Bootstrap is w3.css. This is a server-side programming language. WordPress's backend is powered by this language so, you must know this language. If you are developing a website outside of WordPress, you can also develop by using programming languages like Python, Rubi, Pearl etc. You will need to spend approximately 3 months to learn PHP if you are completely new to the programming language. To carry out your projects quickly, it's recommended to learn a framework like Laravel so that you can complete as many projects as you can to earn a handsome salary. Please note that you may need to set up a local server for learning PHP or the backend of WordPress. If you are using Mac then you can try out MAMP. For windows, you can give a shot to XAMPP. You can also try the Flywheel and AMPPS as your local server. If you want to be an expert in WordPress then you have to know a bit of MySQL. You don't have to necessarily know every nitty gritty about it. This is for the persons who want to work on the backend areas of a website. If you want to be a WordPress developer, you must have a growth hack mindset. Meaning that, you will always have to think out of the box. For example, you should not code from scratch always. You can save your projects in the form of snippets online and later use them to boost your speed in another project. 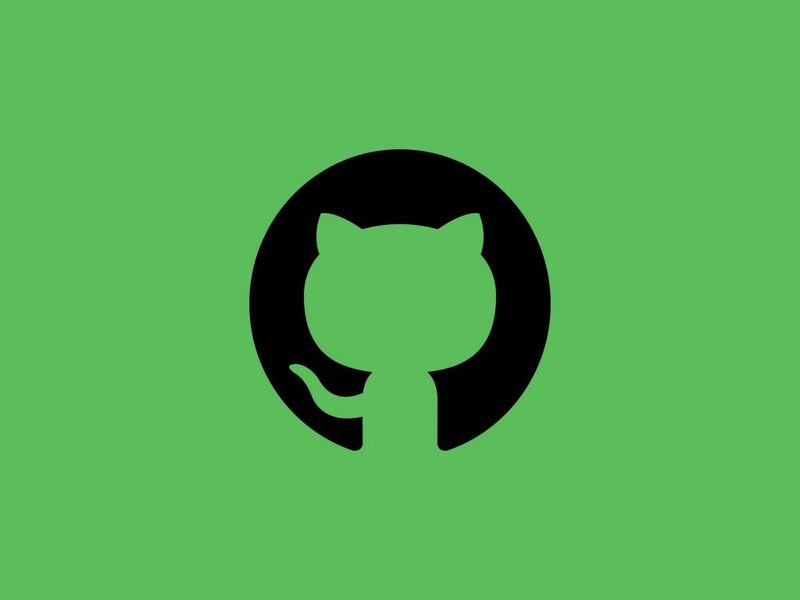 You should learn how to use the online service Github and Bitbucket so that you don't lose your work progress and can resume from the last changes that you made on your codes. All of your hard work will go in vain unless you develop a product that have no demand in market. For instance, if you want to sell drinking water where everyone has a plenty of water you can not sell it there. You must sell drinking water to the customers where they can not avail it. Then after developing and starting to solve problems of your customers, you need to ask your customers “What if they do if you stop developing your tool furthermore?” to check product-market fit. Finally, I would like to say that you should be continuously learning new things revolving around WordPress. Never feel low if you do not know anything as there are tons of free and paid tutorials available on the internet. And never rest in your comfy zone! The WordPress industry is always on new trends. So you have literally to be a growth hacker when it comes to learning newer things that are in vogue to keep yourself up to date. Finally, you have to hone your WordPress developing skills on a regular basis and above all communicate with the WordPress community as much as you can so that you can cherish your love for WordPress in your soul.